How do you meet user-access needs? What do user's digital demands suggest about a proactive practice for acquiring content? How will you perform acquisitions in the future? Author and leading authority known for teaching the popular courses 'Fundamentals of Acquisitions' and 'Fundamentals of Electronic Resource Acquisitions' offered by the Association for Library Collections and Technical Services (ALCTS), Jesse Holden presents a much-needed guide to twenty-first century acquisitions work: a critical - though often overlooked - role in librarianship. Holden's comprehensive approach addresses both fundamental concepts and their translation into practice. He thoroughly explains how the changing dynamics of content formats, information consumption, access, service, and technology have wholly and forever altered the acquisitions framework. Readers will find strategies and approaches for dealing with an abundance of common, day-to-day problems, such as leveraging technology in content management and dealing with the proliferation of available formats. There is a concluding section that expands on the field's emerging user- and content-focus. 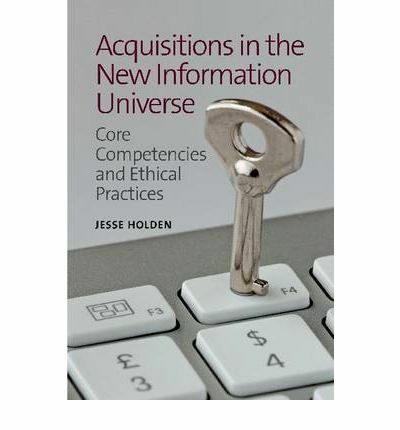 "Acquisitions in the New Information Universe" provides invaluable insights and guidance for both experienced professionals who need to adapt their practices for a changed world and for LIS students.